Eleven decapitated bodies were found on Thursday, November 27. The bodies had been dumped near Colula, Guerrero. 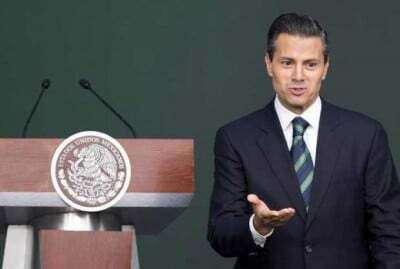 The discovery took place as Mexican president Enrique Peña Nieto was presenting a nationwide project to combat crime that would further militarize Mexican law enforcement and allow the federal government in Mexico City to replace municipal and state governments. State authorities presume that the young men had been shot before being decapitated and that the bodies had been abandoned the night before, following a confrontation between rival drug gangs (the Rojos and the Ardillos) over territorial control. Their heads have not yet been found. The eleven dead add to the long list of bodies that have been exhumed in Southern Guerrero, both before and since the disappearance of 43 students on September 26 and 27 at a normal school (teachers’ college) at Ayotzinapa, Guerrero. In that incident, the local police killed six people, wounding 25 students. The 43 disappeared students have not been found, dead or alive. A month ago, 13 bodies were found in two hidden graves in the same town, Chilapa de Álvarez. Thirty more bodies have been found around the city of Iguala, where the September massacre took place. Almost all have been unidentified. Last week, the Costa Chica community police discovered another 26 bodies. One of them, Jesús Quemada, had been buried with his wallet and was identified from three partially-burnt bank-cards. Quemada’s is one of only four cadavers identified so far this year in Guerrero, out of 89 that have been found. The Peña Nieto administration showed very little interest in the Costa Chica search, “They showed no interest in finding out about the bodies, if they did not have to do with the 43 disappeared students,” declared Napoleón Garibo, one of the searchers. His observation concurs with recurring accusations by social activists that state and federal government officials are criminally indifferent to the plight of the disappeared. They accuse officials of not following accepted procedures, not protecting evidence, not bothering to obtain DNA samples from family members and not even returning their calls. Since 2008, over 27,000 have been reported missing in Mexico. The National Bank of Genetic Data contains 25,884 DNA samples, yet only 542 bodies have been positively identified. Under these conditions, president Peña’s new proposal would give Congress the authority to dissolve city and state governments that are deemed infiltrated by drug gangs and give states control over municipal police forces that are likewise supposed to be corrupt. As if pretending to be a leopard changing his spots, Peña made it clear that his proposal was in response to the Ayotzinapa killings and disappearances: “its cruelty and savagery have shocked Mexico.” In reality, this incident is by no means an isolated one. A recent report by the French magazine FRANCE24 uncovered the kidnapping of 31 high school students on July 7 in Cocula, Guerrero. With this proposal, the Mexican ruling class is moving toward a police state. In addition to giving Congress the authority to interfere with elected governments and to militarize police forces under federal control, the government would create a national identity card that all Mexicans would be required to carry. To begin with, federal police and security forces are to be sent to the states of Guerrero, Michoacán, Jalisco and Tamaulipas, considered the most violent. Federal troops and special security forces already operate in Michoacán and Guerrero at will. While it is not entirely known how much they knew, infantry forces (the 27th Battalion) stationed in Guerrero refused to come to the aid of injured students, and took a hands-off attitude toward the massacre. The 27th Battalion has a sinister history of repression and human rights violations that go as far back as Mexico’s “dirty war” of counterinsurgency in the 1970s and 1980s. In addition to atrocities, the army carried out the “forced disappearance of hundreds,” according to a recent report in the Mexico City daily La Jornada . Peña Nieto would put such forces in charge in cities and states deemed too corrupt or unsafe. It is no coincidence that the Mexican president announced his police state-plan the day after a telephone conference with US president Obama. Following the telephone call, a US government press spokesman used nearly the same phrase (“a tragic and barbaric crime”). One could expect that Peña received Obama’s backing on his police-state measures, and advice and support for measures already taken. A week before, on Thursday November 20th, the police arbitrarily arrested 11 students in the wake of actions carried out by agent provocateurs (alleged “anarchists” throwing gasoline bombs at the police lines), that provided the pretext for a wholesale attack on the demonstration. The 11 students were denied legal counsel and whisked off to high security prisons in Nayarit and Veracruz, both far away from Mexico City. They are being charged with homicide, illegal associations and rioting. All were beaten after being arrested. Administration officials gave a hypocritical assurance that “due process” is being observed. Several videos have been posted on the Internet that shows the random character of the arrests. Alejandro Maxwell, a Chilean graduate student, appears to have been nabbed by mistake after he had arrived late to the demonstration. Federal Attorney General Osorio Chong defended Maxwell’s arrest, accusing him of being one of the most violent of the group. Alberto Maxwell, Alejandro’s father, accused the Peña government of trying to make a case that his son’s nationality proves the connections of the Ayotzinapa demonstrators with international terrorism. His son was initially charged with terrorism, in addition to the other charges. There is a parallel between the arrest of the 11 demonstrators and the police-state measures being carried out in Ferguson, Missouri. In both cases, peaceful protests against wanton murders and human rights abuses are being criminalized by the state.